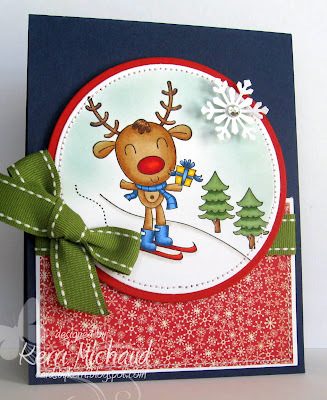 I used this adorable image from Your Next Stamp that I hadn't had a chance to play with yet called Holiday Joy Reindeer. Isn't he so cute?! The dp is some Cosmo Cricket Jolly By Golly and the ribbon is PTI New Leaf. Please check out the Color Throwdown Blog to see the rest of the DT's amazing creations, and to play along! We can't wait to see what you come up with! Awwww, what a darling little reindeer, Kerri, and your coloring looks fabulous!!!! I sooo need that adorable stamp!!!! How CUTE is he!!! LOVE this my friend! I am so sorry about your kidney stone! At least you got to enjoy Thanksgiving and got a lot of shopping done! My hubs gets them A LOT...poor thing. So glad you are feeling better! This is so cute, Kerri! Hope you're feeling better soon! I need to find you a good nurse - lol! Hope you're feeling better real soon! Your skiing reindeer image is just too adorable! Such a fun card! That is the most adorable reindeer, Kerri, and you showcased him beautifully! What a happy and fun card! Hope you're feeling at least a little better now! Awwww! Such a fun image and I like your LO and color choices too. This is sooooo sweet! Your coloring on this cute image is fantastic and I love how you've used this weeks colors!